Although I'm not officially involved in baseball any longer, the game is still in my blood and I was anxiously awaiting today's announcement of the National League's MVP. Joey Votto was my choice and I was not disappointed. Joey's bout with depression following the death of his father several years ago was well documented and I took special notice of Joey at that time. By the way, Joey is a Canadian from Toronto. CONGRATULATIONS, Joey! Joey Votto and Albert Pujols had a long conversation behind the batting cage before a game a few years ago. "There's something about a star player of that magnitude kind of pulling you in and saying, it's OK, we can talk, don't be a rookie right now, we're going to talk like men," Votto said. "I think he made me feel comfortable and a little more confident." Lesson learned. Votto was overwhelmingly elected the National League's Most Valuable Player on Monday, ending Pujols' two-year reign. A first baseman who helped the Reds reach the postseason for the first time in 15 years, Votto received 31 of 32 first-place votes and 443 points in voting announced by the Baseball Writers' Association of America. Pujols, the St. Louis Cardinals' first baseman, was second with the remaining first-place vote, from Joe Strauss of the St. Louis Post-Dispatch, and 279 points after winning the award in 2005, 2008 and 2009. "I tried to keep my head down for almost a year there, and it was nice to speak to somebody who's been there and done that when it comes to everything," Votto said. "For him to give me [the] time of the day and to talk about defensive stuff and ways to improve my game was very generous of him, and he certainly didn't have to do that." Votto was a first-time All-Star, finishing second in the NL in batting average at .324 and third in homers (37) and RBIs (113). He led the NL in slugging percentage (.600), topped the major leagues in on-base percentage (.424) and had 16 stolen bases in 21 chances. Pujols batted .312 and led the NL in homers (42) and RBIs (118). "After the season, when I looked at my numbers and at Albert's numbers, I thought: 'Holy cow! 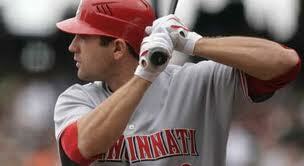 He's beaten me in a lot of them," Votto said. "He beat me in runs, he beat me in RBIs, home runs, I think a couple others. I beat him in a few of the qualitative stats. "I don't know -- I think it was a tossup. I think that it was as close as it can get. I'm not going to go on a limb and say, 'Oh, yeah, I played a heck of a lot better than him because I beat him in batting average, but we all know that batting average is kind of an overrated statistic." The NL Central standings probably were the difference. "Most importantly, we won," Votto said. Colorado's Carlos Gonzalez was third with 240 points after winning the NL batting title with a .336 average. San Diego's Adrian Gonzalez (197) was fourth, followed by Colorado's Troy Tulowitzki (132) and Philadelphia pitcher Roy Halladay (130). Balloting was completed before Votto went 1 for 10 with one RBI and Philadelphia swept the Reds in the first round of the playoffs. Now 27, Votto didn't become a major league regular until two years ago. Following the death of his father in August 2008, he went on the disabled list and missed 21 games the following year partly because of depression and anxiety. "I had a really, really difficult time I guess getting over the death of my father," Votto said. "It's still difficult for me sometimes now. It's hard when you lose someone in your life that means so much. It was a difficult 2009 and quite a bit less difficult in 2010, and I think that was definitely a big reason why I was able to stay on the ballfield every day and succeed and make progress and feel better about life." Votto earned the final spot on the NL All-Star roster by beating out Washington third baseman Ryan Zimmerman, Carlos Gonzalez and Atlanta closer Billy Wagner in fan voting. "I got there and I saw my peers," Votto said. "I saw the A-Rods and the Pujolses and the Jeters. And I thought, 'Well, I just got 14 million votes for the fan voting and I'm still the small fish in the big pond." He joined Ernie Lombardi (1938), Bucky Walters (1939), Frank McCormick (1940), Frank Robinson (1961), Johnny Bench (1970, 1972), Pete Rose (1973), Joe Morgan (1975-76), George Foster (1977) and Barry Larkin (1995) as Reds to win the award. The Reds' 12 MVPs are tied with the Giants for second in the NL behind the Cardinals (17). In the AL, the New York Yankees have won 20. The AL winner will be announced Tuesday. Josh Hamilton of Texas is the front-runner. Pujols has 10 straight top-10 finishes. His three wins and four second-place finishes matched those of Cardinals Hall of Famer Stan Musial. Votto, a bargain with a $525,000 salary, will be eligible for arbitration for the first time. Neither Votto nor Gonzalez ($406,000) had MVP bonus provisions. Pujols gets $100,000 for finishing second. By finishing fourth, Adrian Gonzalez gets a $100,000 raise to $6.3 million next season. Born in Toronto, Votto becomes the third Canadian-born MVP, following Colorado's Larry Walker (1997) and Minnesota's Justin Morneau (2006).